Over 850 years have elapsed since a church was first recorded on this site, that was in c.1140 when Nicholas of Milwich granted it to Stone Priory. Later that century the living was divided between two vicars, but Elias succeeded to both parts before 1198, and he remained for at least 24 years. Little is known of the medieval church and its history. During the 16th century several parishioners bequeathed money to the church, generally for the welfare of their souls, or for additions and repairs to the building. For example, in 1524 John Allen left 6/8d “for to uphold a tapurafore Saynt Anthony”, and a further 6/8d “to the making of a rude loft at Milwich”. In 1535 Stone Priory received £8 10s 0d in tithes from the parish, and the vicar was paid £4 3s 2d. 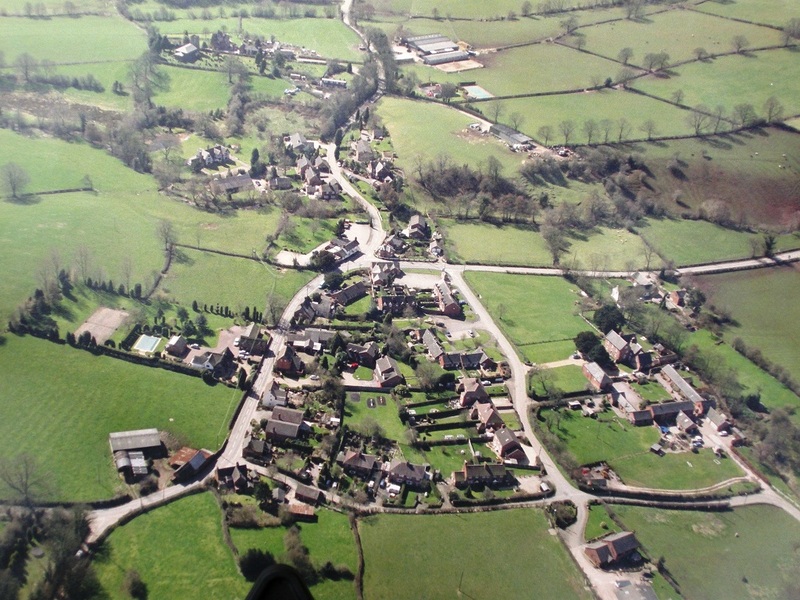 Following the dissolution of Stone Priory the patronage was purchased by Sir Edward Aston of Tixall in 1542, and the present patron, Mr TJA Dive, is descended from him. The church’s possessions in 1552 were listed as “Fyrste ij belles in the stepull, on challes of silver with a pattern, itm ij vestments of diverse collors with all things to them, itm on cope of changeable silke, on surples, on cross of coper, ij candel stykes of brasse and clothes for alter”. The cope had been left to the church in 1510 by William Allen, a citizen of London, and though this no longer exists, the church does still possess one of the bells mentioned in the list, and the silver paten. 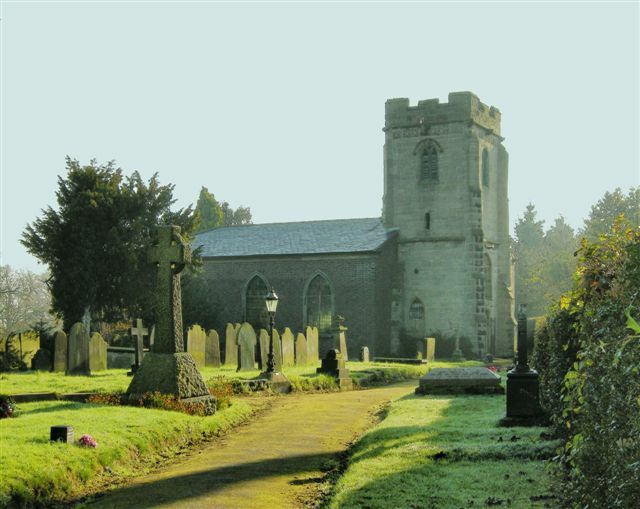 James Shaw was vicar of Milwich from 1610 until his death in 1672, and he continued to baptise and marry people throughout the interregnum. In 1751 the vicar reported that he held two services each Sunday, with at least two weekday services during Lent, and communion was administered four times a year; but 22 years later there was only one Sunday Service. before everything was finally settled. 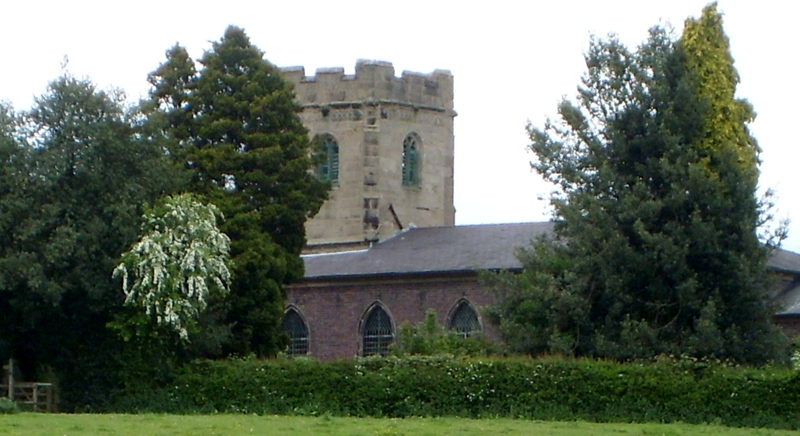 One 19th century curate, Joseph White was forced to leave Milwich because of inadequate accommodation and the poor stipend paid by the non-resident vicar, but he always referred in glowing terms to “dear old Milwich and its beloved Parishioners”. Seven years after leaving he wrote, “nowhere have I experienced such universal kindness and real regard as at Milwich, and such as I cannot forget”. A painting of the church c.1860 shows a three decker pulpit, and the box pews also shown remained until 1906. The walls were lined with pitch pine in 1888 by two local carpenters. In 1906 the interior of the church underwent considerable alteration; the mosaic floor in the chancel dates from this time. The only part of the medieval structure to survive is the Tower, which largely rebuilt in the late 15th century but incorporating earlier features. Around the parapet are five shields, those facing north carry the arms of the Aston and Erdeswicke families, two of the others have the initials WS and RW, and the fifth is also armorial, but the family has not been identified. On the east face of the tower the roof line of the old church is clearly visible. One of the trustees for the rebuilding died soon after the work commenced, his initials and date 1792 appear on the most westerly of the window cills on the north side. On entering the church the oldest memorial is immediately overhead, it is an incised gravestone dating from the 12th century. Nicholas of Milwich was the priest as well as the lord of the manor– could this stone have once covered his coffin? In the belfry hangs one of the church’s most interesting possessions, the oldest dated bell in Staffordshire, and the seventh oldest in the country, it was cast by John of Colsale in 1409. and is one of only two medieval English bells to carry both a date and its founder’s name. The other two bells here are dated 1670 and 1735, all three were retuned and rehung in 1977, and can now only be chimed. The oldest item in the body of the church is the 13th century font, but part of its decoration has been chipped off, possibly at the Reformation. On the north wall is a memorial to George Vernon, a member of an old Milwich family who died in 1818. His gravestone in Colchester is no longer to be found, so probably befell the same fate as several others there which were used by the parish clerk in the 1830’s as paving stones in his garden! The gallery was added in 1837 and the three charity boards on the south wall were painted in 1899. 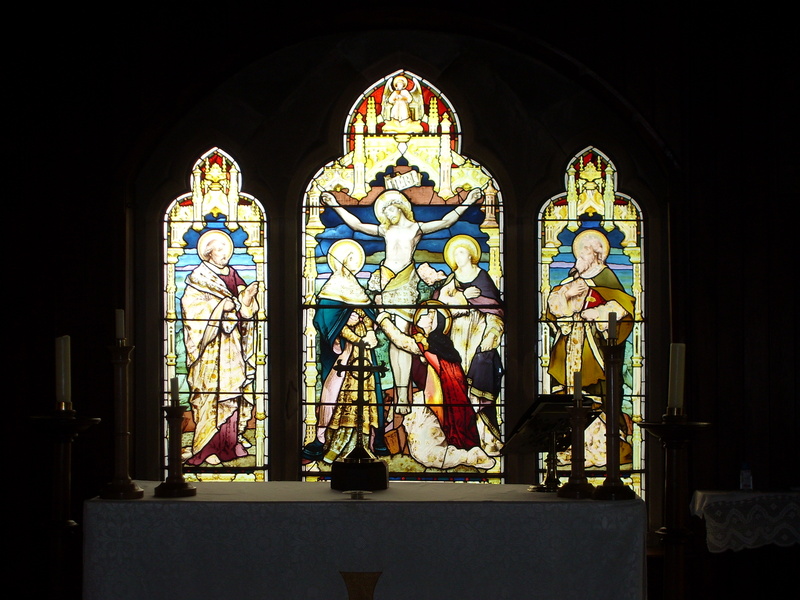 The east window contains the oldest glass in the church, but it only dates from 1888. The eagle lecturn was given in 1904 by William Garle who had been a churchwarden for 40 years. He was also steward of Stafford Weslyan Methodist circuit for some years, an unusual combination of offices. At the front of the church is an ancient parish chest, and the church possesses a pre-reformation silver paten, a chalice of 1638 and a salver of 1682. The registers commence in 1573, and are now with other parish papers at the County Record Office Stafford. In 1594 is recorded the burial of “John, God sent him”. 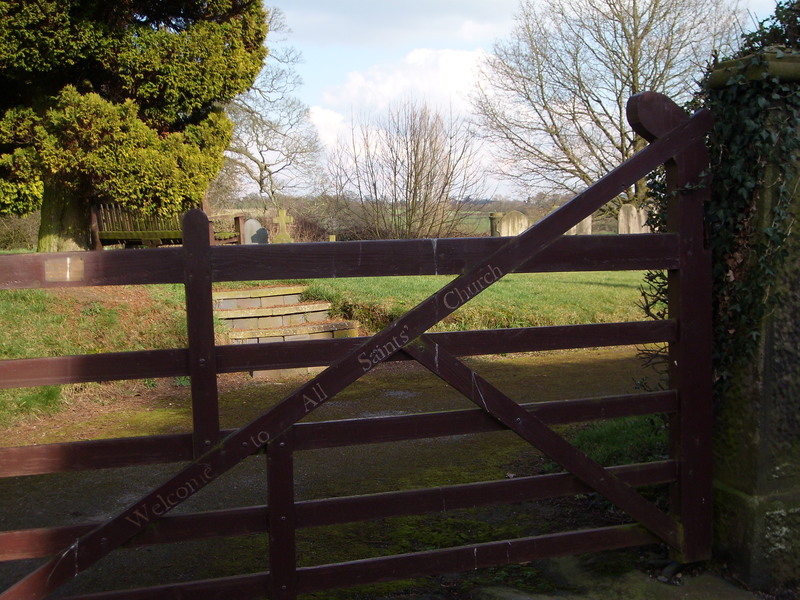 Garshall Green Methodist Chapel was closed at the end of 1981 and since then All Saints has had a combined Anglican/Methodist congregation. A kneeler commemorating this fact can be seen on the prayer desk just in front of the Sanctuary steps. 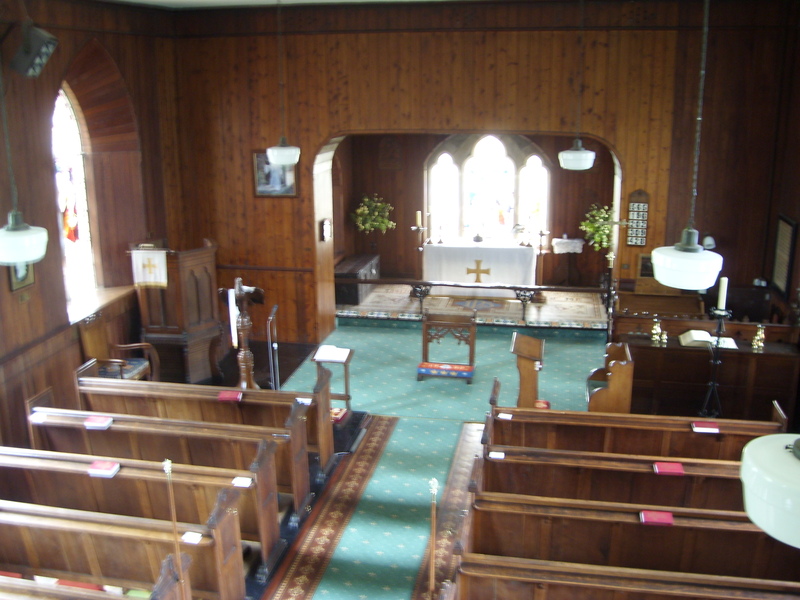 The portable fonts from Garshall Green and Hilderstone Methodist Chapels are both used in the Church font for Baptisms. The oldest gravestone now visible in the churchyard, dated 1729, is near the path just north of the church.